Last May we participated to the MICS seminar held in Turkey and hosted by the Swedish Research Institute in Istanbul. “MICS” stands for Migration, Identity, Communication and Security and its a research network whose aim is indeed that of reflecting on these four areas primarily in the geographical as well as social context of Turkey and Eurasia. Arrived to its third meeting, the theme of the MICS seminar was then communication; more specifically, communication and the events of Gezi Park. from where the concept title: In the Aftermath of Gezi: From Social Movement to Social Change? We contributed to the very interesting round of presentations with a study on media’s role in transmitting or not transmitting the protest’s message beyond the square (physically and metaphorically): to do so, we opted for both quantitative and qualitative analysis of the news articles appeared on the major Turkish newspapers’ webpage available in English. We were also very delighted to listen to the contribution of the other knowledgeable and engaged participants. Debating such questions in a city like Istanbul was also a valuable opportunity for us to observe and confront ourselves with the stark realities of forced migration due to the conflicts in the area yet also to appreciate the beauty, and to some extent the naturalness, of its multiculturalism. 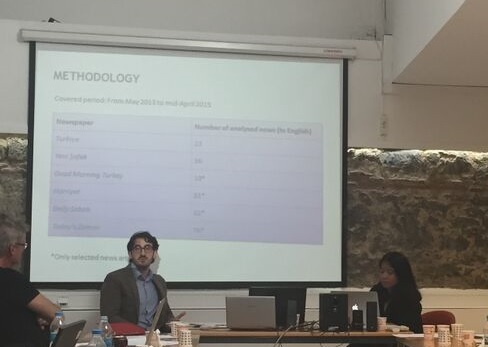 In this way, Zeyno Pekünlü started her presentation during the recent seminar at the Swedish Research Institute in Istanbul. Zeyno Pekünlü, a teacher of arts, was an activist during the Gezi uprisings, and continues to be an activist in social movements in Istanbul. The May seminar she spoke at was organized by MICS, a Swedish funded research network for studies on Migration, Identity, Communication, and Security. The seminar program was organized by Thomas Tufte and Oscar Hemer, in collaboration with Hans-Åke Persson from MICS. Ørecomm participants included Sofia Hafdell, Erliza Lopez, Marco Zoppi and Ronald Stade. The seminar assembled 25 researchers, activists, journalists and students from a broad interdisciplinary field of the social sciences and humanities with the aim to explore the phenomenon of the Gezi uprisings, putting a particular emphasis on what changes they had led to in the Turkish society. We had political scientists, artists, lawyers, media and communication scholars, anthropologists, human rights scholars and activists all delivering their interpretation of what happened during Gezi and beyond. The seminar was organized in three sections. Firstly, we critically assessed the government strategies and responses to the uprisings. Here, we addressed issues such as: What were the government’s rhetorical strategies during the uprising; how can their use of violence be interpreted; and what forms of government control were seen. Secondly, we explored the strategies of resistance that were unfolded during the uprising: was Gezi to be seen as a moment of transgression? How could the uprising be interpreted vis-à-vis historical state-citizen relations in Turkey? What exactly was the ‘Gezi spirit’ and in which ways, if at all, did it translate into social change? Finally, we zoomed in on the role of media and communication in the uprisings. Issues here included the exploration of the role of Twitter in the uprisings with a quick introduction to the political economy of journalism in Turkey; an exploration of the potential of social media as alternative media in the uprising and an analysis of the dramaturgy of the social change as it unfolded in uprisings as Gezi. Overall, we had two very intense days. The interdisciplinarity of the group and the generally deep knowledge and expertise demonstrated there resulted in very insightful discussions for the few of us that weren’t Turkey experts. The seminar was important in the sense that it gave a rare opportunity – both for activists deeply embedded in the change processes, as well as to scholars researching the same processes – to assemble and reflect upon such intense movements and moments of citizen upheaval. Our focus on analyzing the role of media and communication in these processes of change was particularly enriching to the field of communication for development, which in these years is gaining a strong impetus from exactly these sorts of social movements and uprisings. Now, upon return, we are working to pull the presentations together in a joint publication.